MrTenuki: How can white punish the following "non-joseki" moves by black? I tried to come up with a few moves, but none of them seemed adequate. Chris Hayashida: I know Alex already tackled this somewhat, but I wanted to add a few comments. First of all, even though Black's moves are "non-joseki," it does not necessarily follow that there is a followup move for White which directly punishes Black. For example, the resulting shape of the black group may end up being bad, and Black may be forced to play another move later in the endgame. 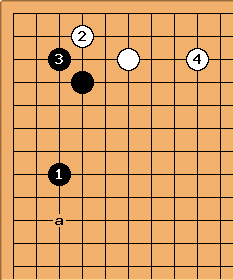 This is similar to 3-4 point low approach keima, except that black's position is one line higher and black already has a side stone (marked). If white plays at a (the slide)... 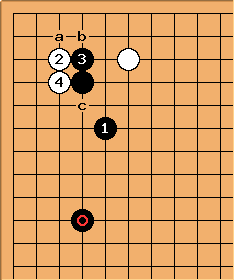 This looks somewhat similar to 4-4 point low approach high extension, except that the bad aji near the marked spot is greater and black has more influence towards the center. Then again, since black already has a side stone, he can always fix it in gote if he wants to. So I'm not sure if this is good enough for white. Alex: I would say this is definitely good for Black, especially if the situation in the lower left is conducive to a moyo. 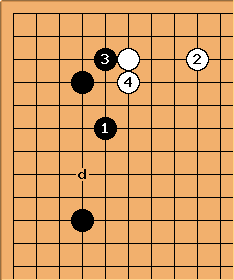 Imagine Black a, White b, Black c as a way to fix the aji around d, not even in gote. Chris Hayashida: While I agree with your comments above, I also think that it really depends on the position in the lower left corner. If there is a solid white group in the left, then I'd say that the black group is a little thin. 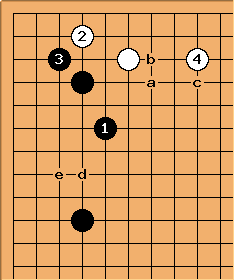 I see potential in an invasion/attachment/crosscut sequence, maybe starting at e, to break up Black's left side. I'm not strong enough to pull it off, though, so maybe I should let stronger players comment. So let's try b... This looks too submissive. Now white's stones are too overconcentrated after . Plus black can still fix the defect near d in gote. 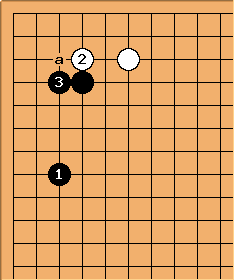 The double kakari at c doesn't look good either, because black can play a splitting attack at . Alex: White would need a lot of thickness nearby to pull this off. And if white invades at the 3-3 point... Black's stones seem to be working together nicely. zinger: I think white needs to add a move here. However, at a would be so good that white should be happy to play it. If black plays tenuki, then white's local result is much better: with black's overconcentrated position also open at the edge, black has little to be proud of. 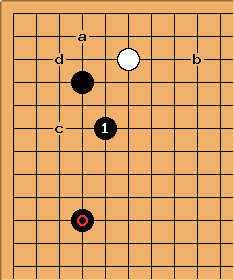 If black answers, then white gets an efficient territory, a group with its head out, and sente. Alex: In most cases, Black would be much better off with this position. Although the only difference is , and instead of Black a, I can't seem to find an irrefutable tewari argument to explain why this is better... just intuitively, though, a stone at a is a kind of redundant with the three stone wall and in place, while and effectively seal White in. Alex: At least now, does not end up redundant with respect to the wall. Black can think about a or b instead of extending at c, since he has in place to prevent White from bending him around with c. Still, forcing White to make a low, territorial position along the left side defies the original point of playing , so Black is still not good here. So, is there a way for white to get a good result? I'm considering d (attach probe? ), but I'm just a DDK right now and can't give good continuations for them. Alex: I could see it happening, but there's no need. Invading 3-3 is really quite good for White in most cases. We already know that playing at a reverts to 4-4 point low approach one-space low pincer, low double approach. As for at b... Yes, I know that the wall height + 1 rule would recommend a 4-space extension here, but this still looks good for black. Alex: This might be fair, depending on the circumstances. Black is overconcentrated (I notice you tend to interpret overconcentrated positions more favourably than they really are... this is normal for players who have not yet learned to deal effectively with invasions... that's a separate issue, though). He would prefer his extension to be one line further from his three-stone wall. If White is strong nearby, though, it might be okay. zinger: Again, I think white needs a move at a - but it's a very good move. If white tries the regular slide... This is obviously too good for black. Alex: Black is a lot thinner here than with the small or large knight's move. A White move around ''a' is much more likely to be sente. I wouldn't necessarily play this way as White, but I wouldn't say it is obviously too good for Black, just more dynamic than a modern player would like to allow. But the attachment at d doesn't look good either... Black gets a nice three-space extension. And white looks heavy now. Alex: This probably reverts to the variation above, since White has little choice but to continue at a.
at a: Reverts to 4-4 point high approach with a black low pincer. Looks complicated. Alex: a is usually the wrong invasion into a three-space mixed extension. Better at the marked point... see James Davies' Attack and Defense the book. Alex: Trying to adapt komoku joseki to the hoshi is generally a bad idea. The reason is that, assuming the opponent follows along and you get the same shape, the opponent will get fourth line territory instead of third, so the result is several points worse for you than in the corresponding komoku joseki. Unless, of course, the joseki you're trying to play trades the outside for the corner, but then the opponent is unlikely to follow the sequence you expect, especially since such exchange josekis often rely on edge effects to work, tactically. Black could just play at a, take a large corner and be happy in most cases. 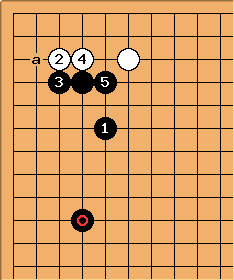 White's large knight's move ends up looking like aji keshi. 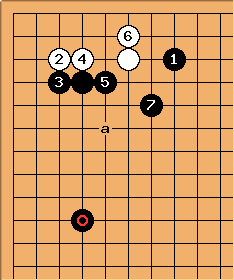 Anyway, even if all of this was shifted one line over, trying to play a fighting joseki like the taisha when the opponent has a stone as close as is probably not a good idea. Taking an idea from the Dictionary of Modern Fuseki - The Korean Style?, I might try the sequence below. tenuki: Black closes the corner at c.
Alex: This way, Black still has a lot of aji around a and b, especially if White manages to connect around c. Meanwhile, c will be gote for Black, because White will atari at d then tenuki again, counting on the combination of , and d (the latter two of which are now essentially kikashi) to ensure life for . On second thought, maybe it would be better for White to just play at e instead of provoking this sequence. Leave the corner even more open. Anyway, the main point I was trying to make is that it's better to just extend in some way and leave the slide unplayed (since forcing Black to play at san-san removes most of the aji). Andy (4k): Just because it's not "joseki" doesn't mean that it's wrong, and really doesn't mean that there has to be a way to punish it. Can you show the rest of the board? The positions in the lower left particularly, but also the upper right are critical in evaluating how (or even if) white is to proceed here. In case 1 in particular, black's move puts so little pressure on white, and does so little to protect the corner and side, that as white I might tenuki and leave your kikashi stone for now, if there is something more interesting on the board elsewhere. As the rest of the board develops, it will become more plain how to continue here. zinger: Also, remember that joseki are developed by professionals. In some cases, the difference between joseki and non-joseki is a fine distinction. The two lines may be different to the pro's discerning eye, and yet be almost indistinguishable to amateurs. There may be nothing more than a small difference in aji, or just a point or two of profit. 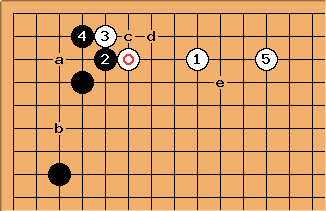 This is why it is dangerous to think that a non-joseki move can be punished. Many a time I have blown up my own position trying to do this! Very often it is right to just go about normal business, perhaps waiting over 200 moves for a small difference in aji to show itself.